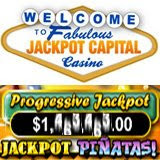 The only million dollar progressive jackpot available to US online casino players is still waiting to be won at JackpotCapital.com where two other progressive jackpots are also approaching a million dollars. Jackpot Piñatas is the largest online casino jackpot currently available to US players. After a $290K win just weeks after the Jackpot Piñatas slot machine was launched, it’s been more than a year since its progressive jackpot has been hit. It currently stands at over $1,093,000 and continues to increase with every spin. Jackpot Piñatas is a twenty-line online slot machine with tacos, beautiful señoritas, fresh limes, roses and various piñatas on its reels. Its free spins, wild symbols, substitutes, and bonus game make the game a virtual fiesta. Five Bull Piñata symbols on any one of the paylines wins the progressive jackpot provided the player has wagered $0.25 per payline. Two other progressive jackpots at JackpotCapital.com are getting very close to a million dollars. The Midlife Crisis and Shopping Spree jackpots are currently over $910K. JackpotCapital’s most recent winner progressive jackpot winner was Cheryl B. of California who won $21K playing Crazy Dragon on December 30th. What a New Year Boost! JackpotCapital.com offers over 300 exciting games, each with state-of-the art graphics and sound to provide a unique gaming experience. Not surprisingly, the most popular games at JackpotCapital.com are the large selection of games tied to the site’s huge progressive jackpots. Just like the slot machines in Las Vegas that contribute to one big mega jackpot, everyone playing card games like Caribbean Hold´em, Caribbean Stud Poker, and Let ‘Em Ride, or spinning slot machines like Midlife Crisis, Shopping Spree, Light Speed, It’s Good to Be Bad, Crazy Dragon or The Shark are contributing to huge and growing progressive jackpots.